2019 Monroe Engineering Products, LLC. All Rights Reserved. Personally Identifiable Information: This refers to information that lets us know the specifics of who you are and where you are. When you engage in certain activities, such as filling out a survey, request for quote, calling us or sending us feedback, we may collect certain information about yourself. It is completely optional for you to engage in these activities. During a normal visit to our site, no personally identifiable information about you is collected unless you have made contact with us. All information on our site is free to browse at your leisure without the need for you to provide us with any personally identifiable information. Our websites collects other information, nonpersonally identifiable information from site visitors. Non-personal information may include information such as tracking the site pages that are visited, ip addresses, cookies, device id's, the amount of time spent on our site, clicks, page views, events (which shopping tools you interacted with), and zip code. Our primary goal is collecting aggregate information from you is to be able to perform analysis that allow us to improve the functionality of the website. We need to collect aggregate information in order to track page visits and peak site usage time, and to perform site clickthrough analysis and site layout re-design. All content, graphics, audio, video, software, and other materials, as well as the HTML code used to create any material on this Site, contained on or available via the Site and the compilation of such materials (the “Materials”) are the property of Monroe Engineering Products, LLC. and/or its subsidiaries or affiliates and are protected by trademark and copyright law and other proprietary rights laws in the United States of America and in other countries. Unless otherwise specified, no one has permission to copy, display, distribute, republish, publicly perform, modify, sell, or create derivative works from the Materials in any form for any commercial, non-commercial, or public purpose. Unauthorized use of the Site or the Materials may violate copyright, trademark, or other intellectual property laws and/or proprietary rights laws, and may subject you to criminal and/or civil liability. Use of the Site or any Materials in any manner not authorized by Monroe Engineering Products, LLC., contrary to the interests of Monroe Engineering Products, LLC., or contrary to any laws in any jurisdiction in which such use occurs, is strictly prohibited. Except as expressly provided herein, Monroe Engineering Products, LLC. does not grant any express or implied right to you under any patents, trademarks, copyrights, trade secret information, or any other proprietary rights. 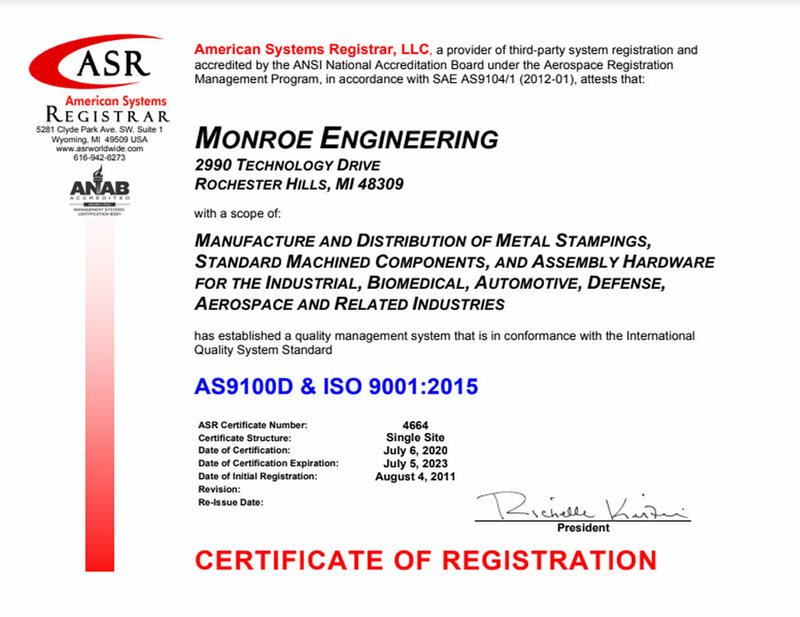 You are hereby granted a limited, non-exclusive, non-transferable right, to the extent that Monroe Engineering Products, LLC. is able to grant such a right, to view the information available from the Site for informational and non-commercial purposes only and to print out pages from this Site for informational and non-commercial purposes only. Any and all copies of the Materials must retain the copyright, trademark, service mark, and other proprietary notices displayed on the Site with respect to such Materials. Anyone under 18 years of age and anyone who is not able to understand or enter into this Agreement for any reason is prohibited from using this Site. In addition to the prohibited uses described above, Monroe Engineering Products, LLC specifically prohibits any use of the Site, and all users agree not to use the Site, to provide any false or misleading information; use any device, software or routine to interfere or attempt to interfere with the proper working of the Site or any activity being conducted on the Site; take any action which imposes an unreasonable or disproportionately large load on the Site’s infrastructure. THE MATERIALS PROVIDED AT THIS SITE ARE PROVIDED “AS IS” WITHOUT ANY WARRANTIES OF ANY KIND INCLUDING WARRANTIES OF QUALITY, MERCHANTABILITY, FITNESS FOR A PARTICULAR PURPOSE, OR NONINFRINGEMENT OF INTELLECTUAL PROPERTY, IN NO EVENT WILL MONROE ENGINEERING PRODUCTS, LLC, ANY OF ITS SUBSIDIARIES OR ANY THIRD PARTIES MENTIONED AT THIS SITE BE LIABLE FOR ANY DIRECT, INDIRECT, INCIDENTAL, SPECIAL OR CONSEQUENTIAL DAMAGES WHATSOEVER (INCULDING, WITHOUT LIMITATION, THOSE RESULTING FROM LOST PROFITS, LOST DATA OR BUSINESS INTERRUPTION) ARISING OUT OF THE USE, INABILITY TO USE, OR THE RESULTS OF USE OF THIS SITE, ANY WEBSITES LINKED TO THIS SITE, OR THE MATERIALS OR INFORMATION CONTAINED AT ANY OR ALL SUCH WEBSITES, WHETHER OR NOT ADVISED OF THE POSSIBILITY OF SUCH DAMAGES. APPLICABLE LAW MAY NOT ALLOW THE EXCLUSION OF INCIDENTAL OR CONSEQUENTIAL DAMAGES AND/OR THE EXCLUSION OF IMPLIED REPRESENTATIONS AND WARRANTIES, SO SOME OR ALL OF THE ABOVE EXCLUSIONS MAY NOT APPLY TO YOU. Monroe Engineering, LLC does not warrant (1) that this Site or its server are free from errors or viruses, worms or “Trojan horses”, or (2) the accuracy and completeness of the materials on this site. We actively scan, use best practices and use ssl. In addition, Monroe Engineering, LLC may make changes to the materials at this Site at any time without notice.